Islamabad, Pakistan (CNN) — The death toll from the strong earthquake that struck southwestern Pakistan this week has risen to 350 as rescue workers struggle to reach victims, authorities said Thursday. 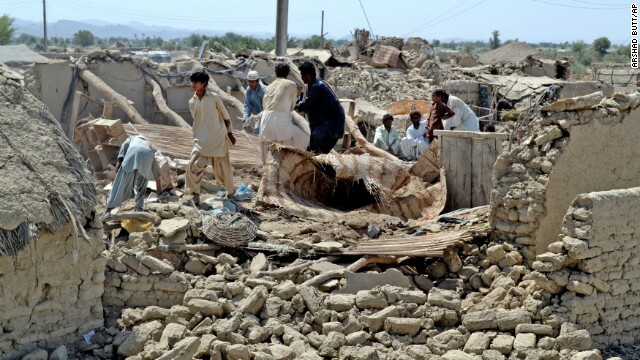 The number of people injured has climbed to 619, said Jan Muhammad Buledi, a spokesman for the government of Balochistan, the province where the quake hit. Authorities estimate that 21,000 houses have been destroyed. The 7.7-magnitude earthquake took place Tuesday in a remote, sparsely populated area of Balochistan. Rescue efforts are under way in the heavily hit districts of Awaran and Kech. Images from the scene have shown buildings reduced to rubble. More people are feared to be trapped under the wreckage, authorities say, suggesting the death toll could rise. The Pakistani military has deployed more than 1,000 troops to help with rescue and relief efforts. The troops are entering a difficult region. Militants fighting for a separate state in Balochistan operate out of part of Awaran district, which has been the site of bombings. The potential threat was underlined Thursday when two rockets were fired at an army helicopter ferrying the chairman of the National Disaster Management Authority to the earthquake zone, a military official said. The rockets missed the helicopter as it flew over the narrow Mashki Valley on its way to Awaran, said Brig. Muhammad Abdur Raheem, an army spokesman in Balochistan. There was no immediate claim of responsibility for the failed attack. Pakistani officials have said the quake was powerful enough to cause the appearance of a small mud island a few kilometers off the country’s coast in the Arabian Sea. But some overseas scientists have questioned whether the island was the direct result of the earthquake.